Daughter1's boyfriend is in the DC area for the month of July, and she really wanted us to meet him. We had exactly one weekend with a window just wide enough to squeeze through, so Saturday was the day. In the meantime hubs had a work trip to Canada added to his calendar, but not a problem because he was still supposed to arrive home Friday evening. The plan was I would pick him up at the airport and then we'd drive down to my moms in South Jersey to spend the night. Our pup was going to hang out with Mema while we drove a little further south to meet our girl in Annapolis on Saturday around noon. That was the plan. You know what they say about plans, don't you? Friday afternoon hubs phoned about 4 pm to let me know he'd finished his meeting, and had arrived at the Toronto airport. He said his flight was already delayed, and he'd keep me posted. At 11:30 PM they finally cancelled his flight. Like I said, no biggie...just seven hours wiled away in an airport on a Friday night. Bother. We could salvage the weekend though, because they put him on another flight arriving in Newark at 8 am Saturday morning. We figured we could still drop the dog at my mom's house and be in Annapolis about noon as originally planned. He phoned again at 1:15 am to say the Saturday morning Newark flight was also now cancelled, and he'd gotten on a flight to Dulles (D.C.) arriving at 7:30 Saturday morning, and could I please let daughter1 know she'd need to trek to Dulles to collect him. For every wonderfully uneventful, somewhat exotic flight he takes, there are ten trips in between that go like this. Its why the frequent business travelers deserve their upgrades and airline rewards. Hubs is a trooper though, so he went to bed at 2, got up at 4:00, and arrived fresh as a daisy in DC at 7:30 am on Saturday. I drove to my moms, said hello and goodbye, left the dog in her favorite spot, and trekked on to Annapolis to meet up with everyone. We were finally all in the same place at the same time around 1. That's the Maryland capitol building in the background, and please just ignore the guy in green trying to untether his boat from the dock. We strolled down to the waterfront before deciding what we really needed was a serious blast of air conditioning. Holy moly it was hot! 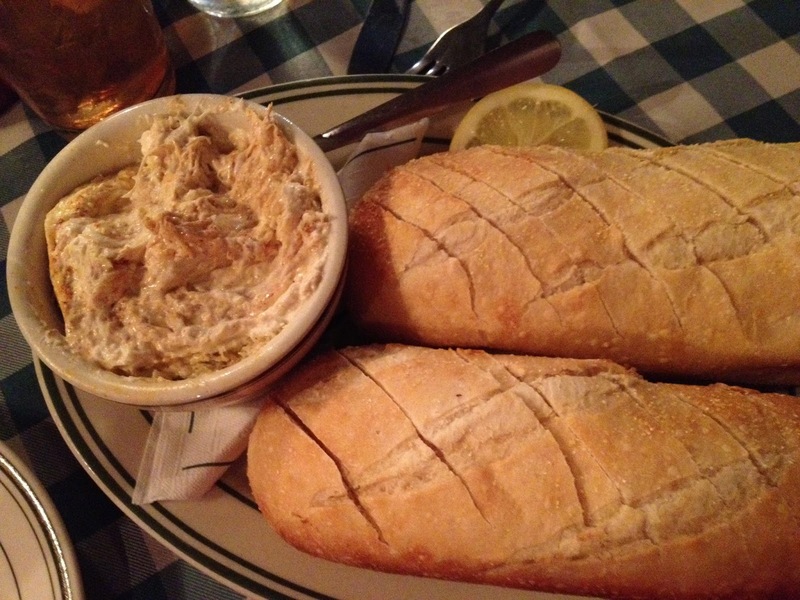 Too hot to be walking around town, but not too hot for some of our favorite mussels and the world's best crab dip. I challenge anyone to prove me wrong on that last point. When we lived in Annapolis and ate in this little spot, Daughter2 would order the crab dip as her entree. That bread is just the right degree of warm. We sat and chatted until we felt like we could brave the heat again, and then walked over to the US Naval Academy to look around. Daughter1's boyfriend is an Army guy, so I had to convince him he needed to stand under the Navy sign for this picture. We looked at some of the indoor exhibits because the walk over about killed us. The grounds are so pretty, but I didn't take a lot of photos...it was just too hot to fool with my camera. I did snap a couple of the gorgeous chapel, and we did go down in the crypt to see where John Paul Jones is buried because it's interesting, and also because it's air conditioned. As it happened a newly married couple and their wedding party were coming out of the chapel as we approached. I could not imagine being in a dress uniform or a bridal gown in the crazy heat, but I have to say the bride was beaming. I love that he's carrying her dress, and she didn't seem to notice the temperature at all. So pretty! We felt it was our duty to introduce the boyfriend to the fine art of picking a Maryland blue crab. Course when they're steamed they're no longer blue, but instead turn a delectable shade of pink with a hefty sprinkling of Old Bay Seasoning on top. This place is always booming. We got there late afternoon, and the temp had dropped maybe an eighth of a degree so we sat outside (under the awning where the ceiling fans whirred) and enjoyed a long leisurely lunch/dinner beside the water. Picking crabs beside the water makes my list of top five favorite life experiences. You should try it, but definitely go with someone who knows crabs...we always smile at the people who come in asking for bibs and a fork. So glad you persevered and had such a nice (though hot of course! haha) day. My favorite kind of days are those spent this way, hot or cold or not. They are both just ADORABLE btw. Daughter1 looks very very happy. Your daughter is beaming and her boyfriend looks very nice (and quite handsome)! So glad it all worked out!! I lived in Maryland for a few years (metro DC for more years) and fell in love with crabs while there. Yum!! You haven't had them until you have them piled in the middle of the brown-paper covered table. Probably won't be able to see you this weekend :( too much going on. Daughter looks soooo happy! I love Maryland crabs-the best!! Ahhh,looks like the perfect weekend. Even though the travel was complicated. I love going to DC and seeing all the men in uniform. Gives me goose bumps. Ha. Looks like a fun and happy time for everyone. First, I certainly feel hubby and your pain when it comes to delayed & cancelled flights! We lived that way for a long time too. Second, I loved your Maryland pictures...and the boyfriend sure looks cute! We could use a bit of that sunshine and heat, to dry things out a bit! Your right, they do deserve all the upgrades they get. Mark just texted me that he was bumped to First Class today. He was delayed a long time on Monday. They are real troopers! So glad that it all turned out and it looks like it was a fun time. I've never had that experience with crabs either. By the way he sure is a good looking guy!